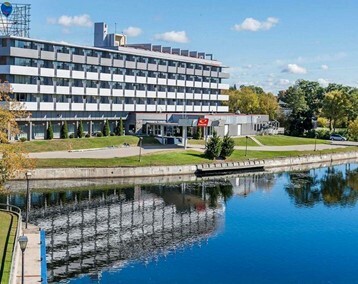 On the Rideau Canal, this waterfront hotel is located in downtown Smiths Falls and a 1.2-km drive from the Smiths Falls VIA Rail station. Contemporary rooms and suites include free WiFi and TVs, plus coffeemakers. Some rooms offer balconies with river views. Upgraded rooms add extra living space. Suites are available with 2 adjoining rooms for up to 5 guests. There’s complimentary continental breakfast, plus an on-site restaurant. There’s also meeting space and free parking.